You can use the room floor system to create a region you can edit from inside Sinespace. This is mostly used for making home regions where users will want to decorate. 1. Have your region set up in Unity. 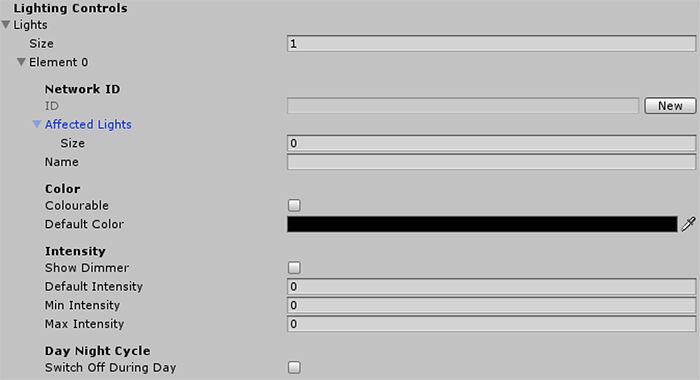 Click on GameObject at the top of Unity and then click 'Create Empty'. 2. Change the transform of the empty object to the position of 0,0,0 if it is not already set to that. You can also rename the empty to something like 'Room Floor' to make it easier to find in the hierarchy. 3. In the hierarchy, click on the empty object you just created, and in the Inspector window on the right, click on Add Component. Search for 'Room Floor' and add it. You will see this in your Inspector window. 4. Add a name into the Name box. This name will be visible to users buying your template if you decide to sell it in the Shop. 5. Add a description into the Description box. This description will be visible to users buying the template if you decide to sell it in the Shop. 6. In the Furniture Quick placement, change the size to the number of floor areas you want in your region. For one area such as one room, change the size to 1. If you are making a house or anything else with levels, you will need to change the size accordingly. The collider to put here will usually be on the 3D object you used as the floor; You can simply drag the whole 3D object from the hierarchy to this box, and it will automatically add the collider. 7. Create another empty object and name it camera target. If you see a dropdown arrow next to room floor in the hierarchy, the camera target object is parented to it. You need make this a single object by dragging it down. 8. Once this is unparented, make sure in the Transfrom under the Inspector window that the camera target is set to the position of 0,0,0. This is used so that the bird eye camera can look down on this object, making it easier for users to edit from top view. 9. Drag the camera target object into the Focus box under Camera and Focus. You can leave the Default Zoom from Focus as it is. Make sure it is above the ground collider and not intercepting it. This collider will go around the area, as shown in this example. If you have multiple levels or multiple buildings, you can add more Room floor components to define different areas. These steps are also covered in our Private Room Template tutorial video. 11. Subletting allows you to share the space with other users. This will be a feature in the near future. 12. Placement Restrictions allow you to restrict placement of items in certain places. If you check this box, and then enter a number in the Size box, this will give you element box with a Collider. For example, if you have built a house with a roof on it, and you don't want users to be able to place items on the roof, you can drag in the roofs' main collider here, and this will disallow placement of items. You can set up multiple areas for restricted placement by changing the Size (e.g from 1 to 5). There is an additional (optional) setting for use within the Room Floor system which allows you to set up configurable buttons. These configurable buttons allow you change certain aspects of the room, such as allowing you to open and close curtains, change from night to day and other settings. As this is a complex setting, you can see our video tutorial for the configurable buttons here. The lighting controls are another optional setting you can use in your room template. The lighting controls will add a button under the Options menu in Edit room, so that the user can change the color and intensity of lights if they want to. 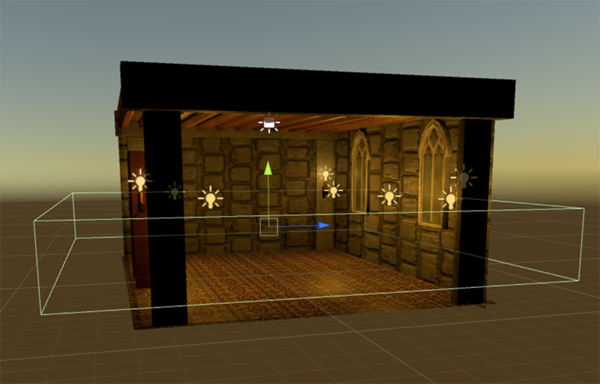 For this to work, you need to have set up your lighting model (e.g. standing lamp or table lamp) with a point light or another sort of light. You can do this buy adding the light as a child object to the light model. The Lights size is the number of sets of lights you want to affect. If you have standing lamps for example in one area, you can have these as one group of lights, and change the Lighting size to 1. If you want to change another group of lights in a different area such as outside as well as the lights in the other area, set this to 2. Make sure you click on New next to the Network ID box. This can be changed manually at another point if need be. 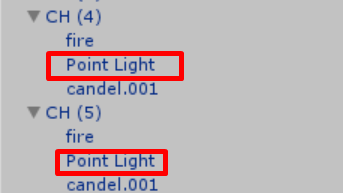 The Affected Lights is where you will need to drag in the lights from the hierarchy. For example, if you have set the Light size to 1, and in this light group you have two candles, you will need to drag the light source from each of these candles into the slots. The light source is the Spotlight, Point Light or Directional Light. The Colour setting allows you to set the lights as colourable, so users can change the color of the lights in their home region. To make the lights colourable, check the box. If you don't want to make the lights colourable, the light color will stay locked to the colour under the Light Source settings. You can see this default color by clicking on the Spotlight, Directional Light or Point Light. If you are making them colourable, set the Default Colour on the Room Floor component to something close to the light source default. Once in-world, users can change this colour to whatever they want. If you want the user to be able to change the Intensity of the lights, you can check the Show Dimmer box. This will add a Brightness slider to the Lights option in-world. The Default Intensity will be the Default Intensity number on your light source. You can then add a Minimum Intensity and a Maximum Intensity to the lights which the users will be able to toggle between using the Brightness Slider. The Day/Night cycle option allows you to have the lights turn off during the day and turn on at night when checked. The Material Controls will add a button under the Options menu in the Edit room system to allow users to change materials on the walls or floors of their home region. They will only be able to change the material if they own material packs bought from the in-world Shop. You can make your own material packs as well to sell in the Shop. Set the Size to how many pieces of furniture you are placing in the region. For example, if you are uploading the region with a bed and sofa already placed, change the Size to 2. These furniture items will In the Element box, drag in the furniture item which contains a room furniture component and a virtual good component. When you upload the whole room template, these items will show in the Edit Room inventory. 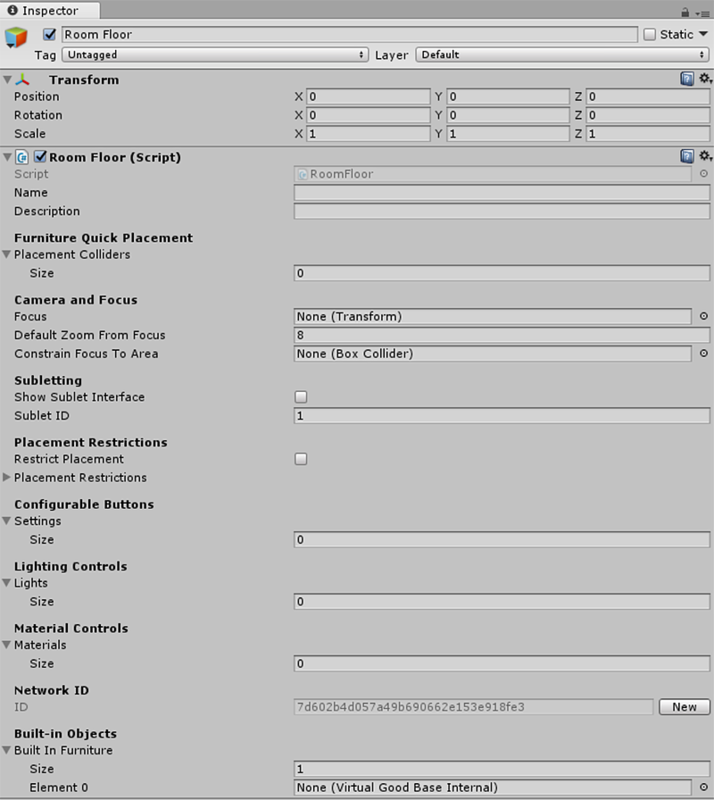 To upload the room template to the Shop, add the Scene Settings component by clicking on Sinespace at the top of Unity, and choose Scene Settings. Once they are added, you will see a Virtual Good component and the Scene Settings component in the Inspector window. Fill in the Virtual Good component Basics tab with the Type set to Region, then the Category set to which ever category is appropriate. Fill in the rest of the virtual good with all of the information, but don't submit the region yet as you will need to fill in the Scene Settings. 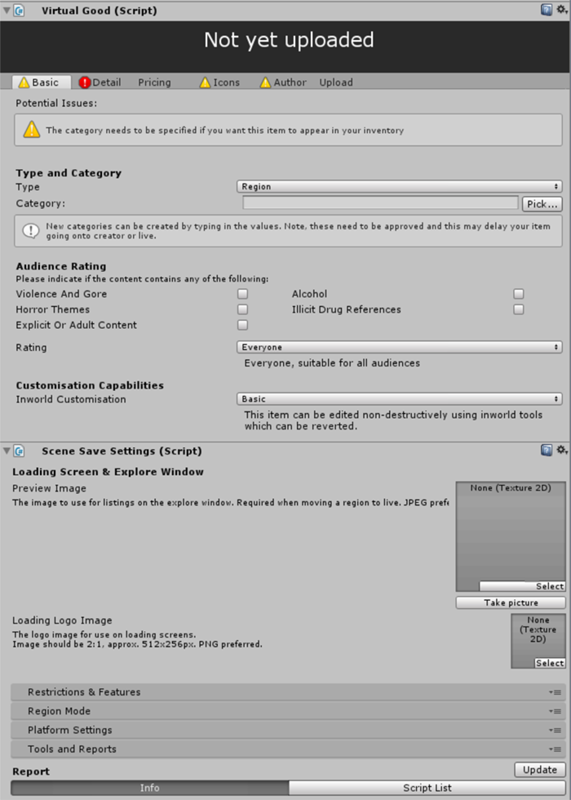 For more information on how to fill the Scene settings, please visit this page. Once it is all filled in, you can then Submit your region. You can check on the upload process at curator.sine.space.